File-83/130 SA. You will receive the item in the picture. DEI 010485. Brake Hub and Rotor Cover, Slip On Design, Heat Reflective Material, Each. Mat Use: Heat barrier. Notes: 14 in. Wide x 7 in. Deep x 13 in. Withstands 2000°F radiant / 500°F of direct continuous heat. DEI / Ny-Trex : 165035. Pressure Safety Switch Style: Normally open. SRI Performance has over 45,000 square feet of NEW & USED racing parts from many of the Top NASCAR teams. Model: 010121. Length: 2in. An all-in-one kit for wrapping a set of headers or motorcycle pipes. 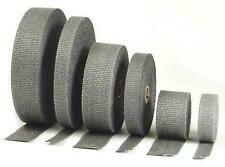 Automotive kit includes two 2” x 50ft rolls of exhaust wrap one can of HT Silicone Coating & Locking Ties. DEI 050505 Extreme Heat Barrier - 1in. x 21in. DEI / Ny-Trex : 130035. Billet Solenoid Mounting Bracket, Aluminum, Each. DEI 070530. Ear Plugs, with Removable Cord, Each. DEI 060104. Racers Tape, Blue, 2" x 90' Roll, Each. Tape Type: Racers tape. Tape Color: Blue. DEI 125043. Fitting, Adapter, Pressure Gauge, -4 AN Male to -4 AN Female, 1/8" NPT Gauge Port, Aluminum, Blue, Each. Fitting Angle: 90 degree. Fitting Size 1: -4 AN. Fitting Size 2: -4 AN. Fitting Size 3: 1/8 in. DEI 010521. Spark Plug Boot Protectors, Protect-A-Boot, 6", Red, Pair. Quantity: Sold as a pair. Heat Protection Color: Red. SRI Performance has over 45,000 square feet of NEW & USED racing parts from many of the Top NASCAR teams. DEI / Ny-Trex : 165050. Power Outlet Adapter w/ Switch, Cigarette Lighter AD, Each. DEI 070511. Safety Glasses, Yellow Lens. DEI / Ny-Trex : 165030. Purge Switch, Push Button, Each. DEI 070510. Safety Glasses, Clear Lens. DEI / Ny-Trex : 165040. DEI / Ny-Trex : 130033. Mounting Bracket, Ny-Trex, Nitrous Solenoid, Bottom Mount, Steel, Zinc Plated, Each. Solenoid Mounting Bracket Style: Bottom mount. Bracket Finish: Zinc plated. Bracket Material: Steel. The High Temperature (HT) Silicone Coating provides lasting protection for any hot surface up to 1500 degrees. These locking ties were designed to secure DEI exhaust wrap but the uses are endless. Made of high grade stainless steel they will stand temperatures in excess of 1371 degrees Celsius and have tensile strength over 100lbs these locking ties will provide a finished look to any job quickly and easily. DEI Exhaust Wrap (tan) 2" x 50ft. Design Engineering Stainless Steel Locking Ties are the perfect way to fasten exhaust wrap for a easy, clean and professional installation. Wrapping headers and down pipes is an important first step in reducing unwanted and power-robbing under hood heat. 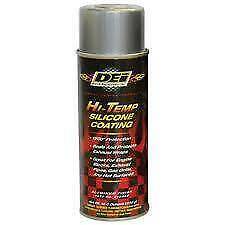 DEI HT Silicone Coating not required. 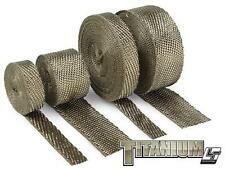 Titanium exhaust wrap, with LR Technology, is made from pulverized lava rock and stranded into a fiber material and woven into a proprietary weave. Perfect for any automotive or motorcycle application! 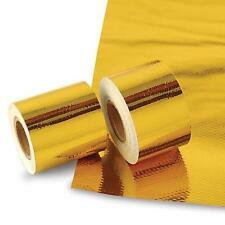 DEI Reflect-A-GOLD - Heat Reflective Sheet - 60cm x 60cm (24" x 24"). - Adhesive protected by a release liner rated up to 325°F. It is lightweight and easy to apply and remove. - For firewalls, bulkheads, engine covers, floors, seat bottoms & more. DEI Exhaust Wrap (tan) 1" x 15ft. Design Engineering Stainless Steel Locking Ties are the perfect way to fasten exhaust wrap for a easy, clean and professional installation. Wrapping headers and down pipes is an important first step in reducing unwanted and power-robbing under hood heat. It’s that easy. - Protect wires, cables, hoses, pipes & tubing from radiant heat sources. - Radiant heat protection up to 2000°F. - Virtually NO clearance needed. Original products.